David Reed is a big hit at parties. That is, once people get past the "yuck" factor of his job. Reed, the associate curator of mammals at the Florida Museum of Natural History (FLMNH), studies lice. Apparently, those same insects that drive parents and youngsters crazy during a school infestation are helping to uncover some deep scientific mysteries. "It's really fascinating how interested people are in lice," says Reed. "Lice are gross and disgusting, and I think that's what first piques people's interest about them. But when you tell people that you can learn a lot about our own evolutionary history by studying lice, they get interested for another reason, too." With funding from the National Science Foundation (NSF), Reed and his team study the evolutionary history of humans and the parasites that have accompanied people from around the time Homo sapiens left Africa nearly 100,000 years ago. For decades, scientists have been studying human migration patterns based on fossil evidence and molecular data like DNA sequences. Studying lice gives researchers one more tool. By collecting lice from around the world and studying their DNA, Reed has been able to aid in reconstructing the past. "We find these "aha" moments where we see that, for some reason the parasites are telling us something different about their shared evolutionary history than what we've learned already from their hosts," says Reed. Scientists know that there are two different types of lice that occur in the New World. One of the questions Reed studies is: When did these two types of lice first come to the New World? "Did one come with the Europeans and one with the First Peoples? That's something we'd like to know more about," says Reed. "If we can find out from the lice when people got to the New World, we can use that information to trace their routes, the timing of when they got to the New World, to see if it confirms or changes what we know about human migration patterns." For example, it is still unclear exactly where the journey began in Asia and when people began their long migration to North and South America. By looking at the lice of today from those New World continents and comparing them to lice from Mongolia, or Siberia, Reed can try to determine the origin. It is also helpful to study lice on other primates, such as chimps and gorillas. "Chimps and humans shared a common ancestor about five to seven million years ago," says Reed. "We also see that the lice that occur on chimpanzees and humans also shared a common ancestor, about five to seven million years ago. So we know that these parasites have been co-evolving with their hosts for at least 25 million years." Recently, Reed received additional NSF funding via the American Recovery and Reinvestment Act of 2009 (ARRA). The new funding allowed him to hire technicians and a graduate student, as well as to purchase much needed infrastructure, such as a digital imaging system to make high-resolution images of museum specimens available to anyone over the Internet. "This funding also allows us to train students to better communicate their research findings to a general audience, an area in which scientists usually receive little or no training," adds Reed. Practical, as well as historical, knowledge can also be gained from Reed's research. 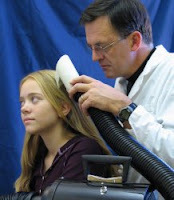 "One thing we can learn from lice is better ways to treat head lice. It's a very, very common problem because these head lice are resistant to the shampoos that we use. The more that we can learn and teach the public about the evolution of resistance to insecticidal shampoos or antibiotics, or whatever, I think the better we can treat different diseases that affect humans," he explains. For millennia, parents of small children have had to deal with the treatment of lice. "We do find with head lice, there's such a stigma associated with it, that there's loss of work for the parent, and for the child going to school. There are billions of dollars lost in the economy every year as a result of head lice infestations," says Reed. "It is all about educating the community in advance of an outbreak," says Deborah Altschuler, president of the National Pediculosis Association (pediculosis meaning "infestation with lice"). Altschuler deals with parents who are horrified and frustrated when their kids come home with head lice. "We at NPA encourage parents to comb, and for a variety of important health reasons. Combing enables families to accurately determine whether there's an infestation or not. It is the best prevention we know," said Altschuler. The association runs a national campaign at the beginning of the school year called "Comb First," designed to educate parents, students and teachers before an outbreak occurs. Altschuler stressed that head lice prevention is not just a September crisis, and that regular screening can mitigate unnecessary and unsafe problems down the road. "Parents are really good about this, if they are given good information. They need help and incentives to screen early," said Altschuler. Some cities now have facilities where kids with head lice can go for combing. The non-profit "Lice Solutions" in West Palm Beach Florida, www.licesolutions.org is one such resource. They also specialize in educating parents, teachers, and school systems about "this unwelcome houseguest." And the organization occasionally provides Reed with live lice for him to study. Reed recently showed off some live insects with a new digital camera system at the museum. With the lice magnified on a monitor, he showed how the tiny creatures have developed some very useful evolutionary traits, like the ability to clutch onto a human hair. The insects can grasp onto a human hair and lock on solidly. "A key to their existence is for them to stay attached to hair. If they don't, they are doomed. And so the reason we care about it really is, we want to know how they get from one individual host to another. From one human or from one child to another," says Reed. Studying lice provides insight about some other intriguing questions. Like, when did humans start wearing clothes? Reed says the answer can be found in studying "clothing lice." "Being a naked primate, we don't have a lot of body fur for them to live in, so when humans lost their body hair evolutionarily, that was a lot of habitat lost for lice. What's interesting though is that when we started wearing clothing, lice immediately went to this new habitat and became what we know as clothing lice, or body lice. They lay their eggs in clothing and they are really tied to human clothing for their whole existence. They come to the body of the human to feed, but only once per day," he explains. Body lice are found on people unable to change clothing, such as refugees, who literally only have the clothes on their backs, and often soldiers during wartime. Reed says he's heard almost every pun imaginable about his work, from, "Of Lice and Men," to "Pair of Lice Lost," to "You must really do some louse-y research." But he says scientists really are just scratching the surface of what these parasites can tell us, especially since there are about 5,000 different species of lice, living on animals from birds to humans to fur seals. And he's constantly working to get both school children and adults interested in his research. "As soon as we show gross, icky pictures of lice and talk about what's really cool about them--their life history, their life cycle, their evolution--people get really interested and they realize that science can be interesting in areas where you didn't necessarily expect to be interested before," notes Reed. Maybe not such "louse-y" research after all!